A multidisciplinary team of University of Ulster academics at theColeraine campus has developed a DVD to support an innovative strategy to teach science to 7 – 11 year olds. The ‘Community of Scientific Enquiry’ (CoSE) strategy was developed by Ulster’s CoSE team, headed by Professor Valerie McKelvey-Martin from the School of Biomedical Sciences in collaboration with Dr Linda Clarke from the School of Education. It is designed to support primary school teachers at Key stage 2 to teach science within the context of ‘The World Around Us’, one of the six strands of the revised curriculum. Professor McKelvey-Martin, who is also Director of Science in Society at Ulster, explained that what is novel about the CoSE approach is the way it facilitates questioning and enquiry through dialogue based on hands-on demonstrations in the classroom. The DVD to support the CoSE strategy, ‘Developing Primary Communities of Scientific Enquiry’ and other support materials for teachers were developed and evaluated with the help of experienced teachers, Lynda Dunlop and Kirsty Compton, who have both worked as Research Associates at Ulster. Professor McKelvey-Martin continued: “The CoSe strategy has been eagerly embraced by teachers and pupils alike, and has certainly helped put primary science firmly back on the agenda. The enthusiastic responseacross Northern Ireland suggests that the CoSE approach to teaching science is here to stay. The DVD was officially launched at Ballysally PS in Coleraine, one of the participating primary schools. Primary 6 and 7 pupils and teachers from two other primary schools also contributed to the DVD production : Buick Memorial PS, Cullybackey with teachers, Mrs Cathy Humphrey and Mr Simon Finlay; and St Colmcille’s PS, Ballymena with Mr Terry Rodgers. Following the launch, Ballysally PS’s pupils and teacher had a special preview of the DVD which they had helped to create. Ballysally teacher, Mrs Gibson said she felt the CoSE approach is ‘spot on’ for teaching science in the revised curriculum. Ballysally Principal, Mr Geoff Dunn said the CoSe project had been very successful and congratulated everyone involved in the project. Pupils taking part in the CoSE project said they thought the experiments they did in the classroom were ‘fantastic’. “Whenever our teacher said we were doing a science experiment, we got so excited. It made us want to experiment more at school and at home. “Scientific Enquiry was a great way to get us to enjoy and take part in science. The only problem was not having it for long enough. It was so good that we all want more. To date, 29 primary schools across Northern Ireland have integrated the CoSE strategy into their science teaching. Additional funding received from the Astra Zeneca Science Teaching Trust has supported the production of the DVD training resource for the teachers already using the approach to help train their colleagues and enable widespread use of CoSE in primary schools throughout Northern Ireland. The CoSE strategy for teaching science has also now been successfully implemented in over 20 post- primary schools as a result of funding to the CoSE team from the Wellcome Trust. 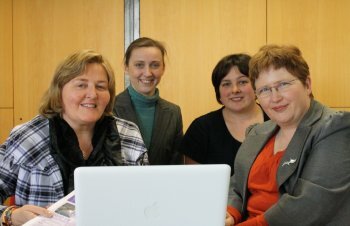 Caption CoSE TEAM: Professor Valerie McKelvey-Martin, Kirsty Compton, Lynda Dunlop and Dr Linda Clarke.